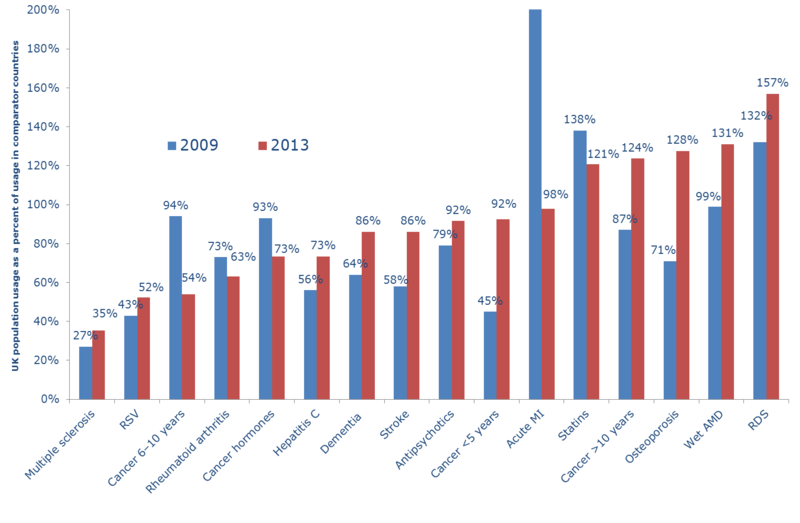 This analysis highlights the usage of important classes of medicines in the UK relative to 12 comparable high-income countries including France, Germany, Italy, Spain and the USA. Sixteen classes of medicines were included in the original Richards report covering key primary care and secondary care therapy areas such as cardiovascular and cancer. OHE used the same method as that in the 2010 Richards Report. Volume usage of medicines (proxied by sales volumes) per head of total population in each country was calculated. Medicines in each class were combined using a comparable unit of volume (e.g. defined daily doses, milligrams etc.). For cancer this approach was not possible and un-weighted ranking scores for each cancer medicine were combined. UK usage per head of population of each class of medicines was then expressed as a percentage of the international average rate of usage per head of population across all of the countries. A score of 100% would mean the UK matches the international average. It was beyond the scope of the report to determine the causes of the observed differences in usage between countries. A complementary report to the OHE analysis published by RAND Europe – commissioned by the Department of Health in England – explores some of those issues in five therapy classes. Access the OHE analysis here. The accompanying RAND Europe report can be found here.